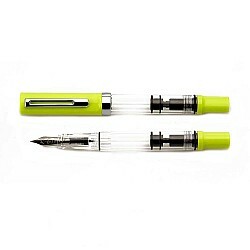 The TWSBI Eco-T (short for economical) is the least expensive fountain pens that uses the piston filling mechanism. The resin TWSBI Eco-T fountain pen.. The TWSBI Eco-T (short for economical) is the least expensive fountain pens that uses the piston filling mechanism. 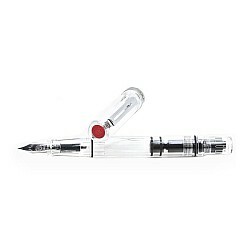 The resin TWSBI Eco-T fountain pen has clear barrel that shows the mechanism very well. The clear body gives the TWSBI also a different look witht he ink it is filled with. The faceted cap gives the TWSBI Eco-T a powerful appearence. The TWSBI logo finish the top of the cap. The ECO-T has a slightly more pronounced grip section than the standard Eco; to help with learning correct writing posture for kids, new enthusiast pen users, and anyone who likes a little bit more structure to the grip area. The cap and end cap also have a rotary triangular shape design. The TWSBI Eco-T Fountain pen has a polished stainless steel nib engraved with the TWSBI logo, available in several sizes. TWSBI fountain pens can be entirely disassembled for the purposes of cleaning and servicing. Instructions and necessary tools are supplied with each TWSBI fountain pen. Please note that the disassembly feature is only there for experienced users and is not necessary for normal use. Disassembly is at your own risk! With a history of more than 40 years of manufacturing, including producing high-end pens for other brands, Ta Shin Precision decided to start selling under their own brand, TWSBI. The name TWSBI is made up from TWS and BI. ‘TWS’ is the reversed initials of the phrase ‘San Wen Tong’, translated Hall of Three Cultures, and ‘BI’ literally means writing instrument. The TWSBI Eco (short for economical) Black is the least expensive fountain pens that uses the piston filling mechanism. The resin TWSBI Eco fountain p.. The TWSBI Eco (short for economical) White is the least expensive fountain pens that uses the piston filling mechanism. The resin TWSBI Eco fountain p..